Root canal treatment helps to save your tooth and avoid extracting it. A root canal treatment (RCT) is recommended for a vastly damaged tooth or a serious tooth infection (abscess). A deep cavity, a cracked/fractured tooth, injury to the tooth can cause infection of the pulp (soft tissue inside a tooth). When the pulp is infected you will feel pain, swelling or abscess can form around the end of the root of the tooth or in the bone around the tooth.This infection can lead to tooth loss, as the bone around your tooth might be damaged. Before RCT localized dental X-Ray or Panoramic dental X-Ray will be done to have a clear view of your tooth and the bone around it. A dentist will use local anesthesia to numb an area around and inside the tooth so that you will feel a little to no pain during the procedure. To protect your tooth from viruses, bacteria, and fungus and to keep your tooth dry a dentist will put a “rubber dam”(a thin sheet of latex rubber) over it. Create an access hole in the top of the tooth. 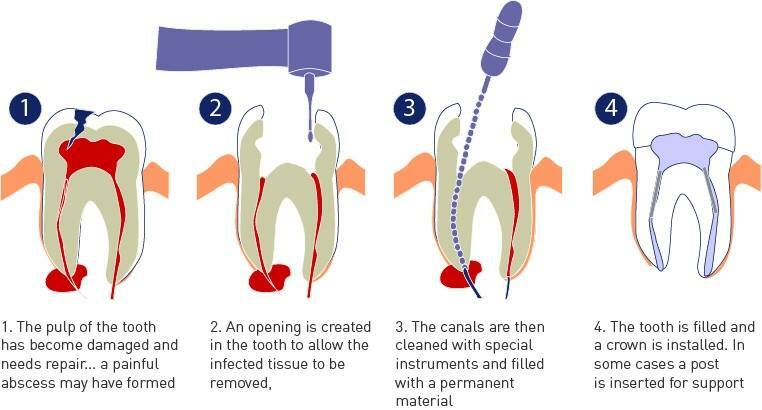 Remove the infected tooth nerve and pulp tissue from inside the tooth. Your dentist will studiously clean each root canal and inside the tooth and may cure the tooth with microbe-killing medicine. Fill in the root canals with a rubber compound to seal them against future infection. Place a temporary filling over the access hole to protect you from root canal pain. A dentist may prescribe antibiotics to avoid the infection to spread. The area around your tooth and tooth my stay sensitive for a few days. Your dentist will explain how to relieve sensitivity and discomfort you may have. During your follow-up visit, your dentist will replace temporary filling with a permanent filling or a customized crown. With good oral hygiene, your tooth can last a lifespan. Brush your teeth twice a day for two minutes, floss between your teeth once a day and see your dentist for regular check-ups.